Last year, as Tony Villanueva of The Derailers prepared to leave his Austin home for a short visit to Nashville, he laid his youngest son down for a nap. To relax him, Villanueva softly crooned a beautiful old country tune, "Waltz of the Angels," which had been a hit for Wynn Stewart in 1956 and was later recorded by Lefty Frizzell and by George Jones. "I love that song," says Villanueva, guitarist and co-leader of The Derailers with longtime partner Brian Hofeldt. "It's something I've sung a lot for both of my boys at bedtime. It's a waltz, obviously, and it's got this real soothing, sweet quality to it." As it turns out, "Waltz of the Angels" would play a significant role in the recording of The Derailers' third, and best, album, Full Western Dress. The new LP, released Sept. 28, finds The Derailers moving beyond their image as sharp revivalists, presenting a more forceful and more distinctive take on their tradition-based sound. In doing so, the quartet appears poised to move beyond its favored bar-band status and to take a leading role in the back-to-roots country music movement. The most compelling story behind the album's creation comes from the series of incredible coincidences surrounding one of the album's most striking songs, "Play Me the Waltz of the Angels," a new tune that includes a lyrical and melodic reference to the old country classic. The story begins when Villanueva arrived in Nashville the day after singing his son to sleep. That afternoon, Villanueva met with songwriter Rory Lee, a Music Row song pro. During a break in their songwriting session, Lee pitched another tune to Villanueva. As soon as Lee said the title--"Play Me the Waltz of the Angels"--Villanueva smiled. He told Lee how much he loved Wynn Stewart's song and mentioned that he had sung it the previous day at home. A smile of recognition crossed Lee's lips. Then Lee told Villanueva the story behind his tune, which he had cowritten with Dennis Knudsen. Apparently, though Lee knew the melody to "Waltz of the Angels," he'd never heard a recording of the song. Instead, his grandfather had taught him to play the tune when he was a young boy, and he'd never forgotten it. Also set as a waltz in 3/4 time, "Play Me the Waltz of the Angels" tells of a young man leading a country band in an evening performance at a retirement home. Most of the crowd responds by dancing and living it up, but one man at a corner table appears sad throughout the evening. Eventually, the singer asks him if there's anything special he'd like to hear. The man looks up, smiles as tears come to his eyes, and asks to hear "Waltz of the Angels." He informs the singer that it was his wife's favorite, explaining, "It was playing the night that I met her, and it was playing when we laid her to rest." Villanueva listened to the song and was stunned. "Rory told me he thought it would be really cool for a new artist to do the song as a duet with an established artist," he says. Villanueva agreed that having an older country singer assume the role of the widower would add to the emotional impact of the tune. He also knew exactly who he wanted to sing the part: His friend, and one of his primary influences, Buck Owens. From the time Villanueva and Hofeldt formed The Derailers in the mid-'90s, they've embraced comparisons to Owens and his landmark early-'60s work with The Buckaroos. The influence is obvious: Like Owens and The Buckaroos, The Derailers (Villanueva, Hofeldt, drummer Mark Horn, and bassist Ed Adkins) favor Texas shuffles, keening harmonies, and trading solos between the steel and electric guitars. Though the band members stick with classic country rhythms, they present their up-tempo tunes with a rock-like verve similar to that of The Buckaroos. Owens has been a vocal supporter of The Derailers since 1996, when the band released its first widely distributed album, Jackpot. Since then, the group has appeared regularly at the Crystal Palace, Owens' Bakersfield nightclub. 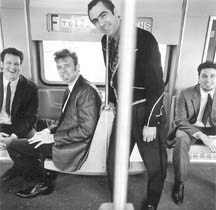 The Derailers served as house band for a Buck tribute night at the Crystal Palace last year, and they were also on the bill with Owens for a special New Year's Eve performance ringing in 1999. It was during the New Year's Eve performance that Villanueva approached Owens about performing a duet with the band on "Play Me the Waltz of the Angels." As he handed Owens a tape of Rory Lee's version of the song, the Country Music Hall of Famer responded, "I don't know if you know this, Tony, but there's already a song called `Waltz of the Angels.' "
Villanueva explained that he was indeed aware of it, and that the new song quoted the melody of the original tune. Then Owens told Villanueva something he didn't know: "Well, you know I played guitar on the original version that Wynn Stewart recorded." Suddenly, the serendipity surrounding "Play Me the Waltz of the Angels" was overwhelming. Laughing out loud, Villanueva shook his head and stressed to Owens that obviously fate was on their side and that he really hoped Owens liked the song and would agree to sing it with him. But when Villanueva checked back a few weeks later, he discovered Owens had misplaced the tape of the song--the singer had yet to hear it. Meanwhile, The Derailers had recorded the rest of their album and needed to send it to Sire Records to meet their deadline. It looked as if the dream duet might not take place--at least not in time to be included on the new album. Owens contacted Villanueva two days after the band shipped the final masters of the new album to Sire Records. "Tony, I found that tape, and, man, I love that song!" Villanueva remembers Owens telling him. "It really cuts to the bone. I'd love to record it with you." They went ahead and did it, even though the album had already been turned in. Once Sire Records heard the duet, the label agreed to add it to Full Western Dress, which hits stores this week. Cut in the mold of classic barroom country tunes by George Jones and Faron Young, the song is a primary reason why the new album hits so deeply and powerfully. "I think we're playing at a higher level now," Villanueva says. "I'm happy how things have worked out for us, actually. It's been a really natural way of growing. We started out in small clubs in Austin, then graduated up to playing dance halls in Texas. We'd do a little tour here and there. Then we started making albums and got a van. Then we got signed to a major label and got a bus. "But all along we've been a band. We write the songs, we learn them together, and we put them down in a certain way. There's a bond between us, and a sound, that we think only we have, and we're really proud of what we've become and how we sound now."